A ULA Atlas 5 rocket carrying NASA’s Lunar Reconnaissance Orbiter and Lunar Crater Observation and Sensing Satellites (LRO/LCROSS) rolls out from its Vertical Integration Facility at Space Launch Complex-41, Cape Canaveral Air Force Station, Fla., to its launch pad for a June 18, 2009 launch. Nearly 40years after humans first set foot on the lunar surface, NASA is gearing up togo back with the planned launch today of two unmanned scouts, the robotic vanguardfor the first U.S. return to the moon in a decade. 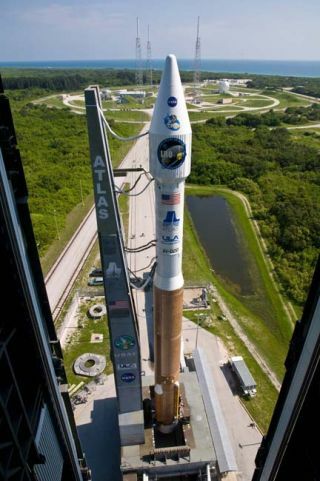 An Atlas 5rocket is poised to launch the two probes, a powerfullunar orbiter and a smaller spacecraft that will hunt for water ice bycrashing into the moon, at about 5:12 p.m. EDT (2112 GMT) today from the CapeCanaveral Air Force Station in Florida. The mission, NASA hopes, will lay thefoundation for its plan to return astronauts to the moon by 2020. ?We'regetting ready to take longer strides. To leave the shallows, once again, andstep into deeper waters of what President Kennedy called the new ocean ofspace," said Todd May, manager for NASA's Lunar Precursor Robotic Program. "The first island we plan to explore is the moon itself, ournearest neighbor." The $583million mission has been delayed since October 2008 and was slated to launch onWednesday. But NASA opted to delay the flight by one more day to allow thespace shuttle Endeavour to try and launch after a hydrogen gas leak thwarted itsinitial attempt. The leak reappeared and the shuttle remains on Earth at thenearby Kennedy Space Center in Cape Canaveral, Fla.
Shuttledelay aside, NASA?s two new lunar spacecraft are ready to fly. They arethe first U.S. moon probes since 1998?s Lunar Prospector, though China, Japanand India have sent lunarprobes in recent years. Today?s launch is also the inaugural flight ofNASA?s long-term exploration vision of sending astronauts back to the moon tostay. DuringNASA?s Apollo lunar landing missions, 12 astronauts explored six equatorialregions on the moon for days at a time. When astronauts return, NASA plans tosend them to unexplored regions, like the tantalizing south pole, for months ata time. But to do that, scientists need to know more about the long-termenvironment future lunar astronauts will face. The newmission?s flagship is NASA?s Lunar Reconnaissance Orbiter (LRO), a satellite thesize of a Mini Cooper car with a roof rack that will build new maps of the moonin unprecedented detail to seek out future landing zones and resources forastronauts. ?Probablymost important to all of us is to find safe landing sites, but we also need tofind interesting landing sites,? said Craig Tooley, NASA?s LRO project manager. LRO iscarrying seven instruments to map the moon from a 31-mile (50 km) orbit,measure its temperature extremes and study its radiation environment using aspecial plastic designed to mimic human tissue. It will spend a year studyingthe moon to aid future astronaut missions before NASA turns it over to ascience team for a potential years-long extension. Ridingpiggyback on LRO?s Atlas 5 rocket is the Lunar CRater Observation and SensingSatellite (LCROSS), a smaller probe added because there was extra room on thebooster. LCROSS is NASA?sdouble whammy for the moon to dredge up any water ice hidden in permanentdarkness at the lunar south pole. Pastmissions have found ample traces of hydrogen suggesting water ice may lurk inthe moon?s shadowed craters, but NASA hopes LRO and LCROSS will be able to finddirect evidence of the wet resource. There areno guarantees the water ice is actually there, or what kind of shape it is in,mission managers said. Some observations predict ice rinks of the stuff, whileothers suggest the ice is in blocky chunks or buried, if it is there at all, theyadded. ?Thatillustrates the importance of our mission,? said Daniel Andrews, NASA?s projectmanager for the LCROSS probe. ?Let?s go see what it is.? It costs$50,000 a pound to send anything to the moon, so finding water ice or permanentregions of sunlight for solar power stations could be vital to help supportfuture moon bases, NASA officials said. Unlike LRO- which should take just four days to reachthe moon - the smaller LCROSS will spend months attached to the Atlas 5rocket?s large Centaur upper stage, which it will ultimately steer into a steepcollision course that will slam into a shadowed crater at the moon?s south poleat about 5,580 mph (8,980 kph). After studying the crash from afar, LCROSS willfly through the crash plume and make its own death dive minutes later. LRO, theHubble Space Telescope and other assets in space and skywatchers on Earth areexpected to observe the lunar smackdown, which is slated to occur in earlyOctober. The final collision date depends on when the mission launches. Thetarget crater will be decided about a month before impact. ?Thespacecraft is here now, we?re ready to go for launch and the science team isready,? said LRO project scientist Richard Vondrak. LCROSS isfollowing in the footsteps of many spacecraft that have intentionally hit themoon. Earlier this month, Japan?s Kaguya lunar probe ended its year-longmission with a moon crash. China?s Chang?e 1 probe did the same earlier thisyear. The Atlas 5rocket carrying the LRO and LCROSS probes actually has three chances to blastoff today. NASA is targeting the first opportunity, but two other one-secondwindows are available at 5:22 p.m. EDT and 5:32 p.m. EDT, respectively. If therocket is unable to launch today, NASA can try again Friday at 6:41 p.m. EDT(2241 GMT). Two other Friday opportunities are available in 10-minute intervalsafter the first target. The mission?s flight window closes on Saturday, afterwhich the two lunar probes would have to wait another two weeks before the moonreturns to a position that is favorable for launch. Aftermonths of delay, LRO and LCROSS researchers said they are chomping at the bitto get started. ?We wereready to go last fall,? Vondrak said, adding that the delays were frustratingat times. ?We?re eager, we?re ready to go.? NASAwill broadcast the launch of its new moon probes on NASA TV beginning at 2:00p.m. EDT (1800 GMT). Clickhere for live launch coverage and SPACE.com?s NASA TV feed.